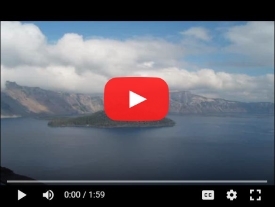 Klamath County is proudly the “Home of Crater Lake National Park”. Klamath County is also the fourth largest county in Oregon encompassing more than 6100 square miles. Considered high desert, the region basks in an average of 300 days of sunshine per year. Klamath Lake, which covers 133 square miles, borders the city of Klamath Falls on the north and is the largest natural lake west of the Great Salt Lake. Prior to official status in 1882 and long before the Great Migration in 1843, indigenous people were attracted to the easy life of southern Oregon in the Klamath Basin. Adapted to the marsh and riverine environment, the Klamath and Modoc cultures thrived. Immigrants began to arrive and the Oregon volunteers established Fort Klamath in 1863. The town of Linkville was platted along a short river linking two large lakes. In 1893, the name was changed to Klamath Falls. The coming of the railroad in 1909 changed the economic climate. A means to ship goods was provided and the region developed its timber and agricultural resources rapidly. Today, unlimited recreational activities abound. Mountains, lakes, streams, and the high desert offer experiences ranging from mountain biking to fly-fishing. Cultural activities proliferate in theaters, museums, and historical attractions. A progressive community, Klamath Falls has an active downtown redevelopment program. A community action plan was developed and published in 1992 to set goals through 2002. Hundreds of local citizens participated. Klamath County has a population of 63,775 with most of its residents located with in the county seat of Klamath Falls and it’s urban growth boundary. The urban growth area of Klamath Falls accommodates 40,100 visitors, which includes the 20,940 residents of the City of Klamath Falls. Klamath Falls is classified as high desert with total precipitation averaging 18.05 inches annually including snowfall averaging 38.5 inches annually. Framed by the Cascade Mountains on the west, at an elevation of 4,105′, the humidity is low and temperatures seldom rise above 100.